How Can an Orchestra Address the Crisis of Homelessness? 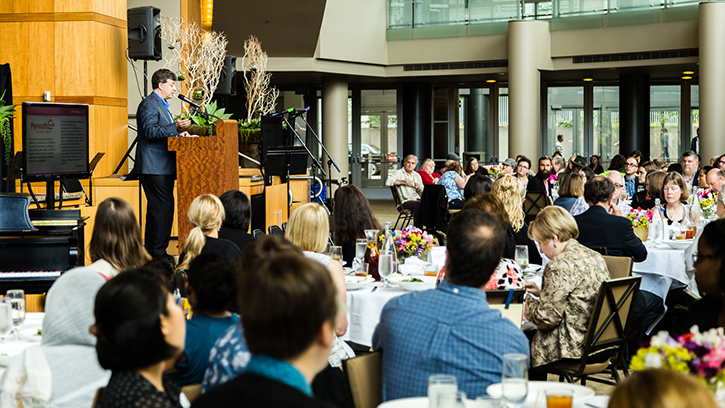 Seattle Symphony President & CEO Simon Woods delivered the following remarks at a luncheon honoring the Symphony’s nonprofit partners on Tuesday, June 21, 2016. During the luncheon, he announced a new multi-year initiative: Simple Gifts, an organization-wide commitment to homelessness. I must say this is one of the most heart-warming and meaningful events that we have witnessed here in this space in years. It’s quite moving to look around the room and see representatives from so many organizations who work so hard in our community to make Seattle a better, more humane, kinder place to live, and I want you all to know that at the Symphony we are truly honored to be able to count you as our partners and friends. Today is not only an opportunity to thank our community partners for the incredible work you all do in our community, but also an opportunity for us to announce a major new initiative around homelessness, which we’re calling Simple Gifts. Five years ago our Music Director Ludovic Morlot and I arrived in Seattle to take over the reins at the Seattle Symphony, and it quickly became clear to us that one of the most important things we could do would be to redefine the way the Symphony related to our community. We wanted to look beyond the idea of a symphony orchestra which just played great music for paying audiences in a beautiful concert hall, and think more deeply about what role we could play in helping create a healthy society in our city. One of our first important statements was to open the Symphony up to those who would not normally be able to attend. So back in 2011 we launched our Community Connections program with just four partners: Joint Base Lewis-McChord, OneAmerica, Senior Housing Assistance Group and the Post-Prison Education Program, using unsold seats in the hall to spread the inspiration to those who could most benefit from it. Five years and more than 6,000 tickets later, we now have sixty partners, many of whom are represented in this room, working in many important sectors including social services, youth, veterans, seniors and health services, and we are thrilled to be able to support them through free tickets, through musical residencies in their facilities and through large scale artistic collaborations. Over the last three years, through the Community Connections program, we have been particularly inspired by our collaborations with organizations serving those experiencing homelessness. Among the many pressing needs in our society, none seem more urgent in the Pacific Northwest than this issue. So we have started to ask ourselves: What role might we play, as one of our region’s major arts organizations, in addressing the homelessness crisis? What we can’t do, of course, is put a roof over people’s heads, or provide clean clothes and food and drink. But we have heard time and again — and seen with our own eyes — that music can create a real sense of comfort and safety for people whose lives feel overwhelming, that shared musical experience can bring individuals and communities together in powerful ways, and that music has a unique power to remove barriers that isolate people and to help manage anxiety and stress. And our partners like Mary’s Place, Path with Art, Compass Housing Alliance, Plymouth Housing Group and YouthCare, have told us that they and their participants tremendously value this work in nurturing the spiritual needs of those who are going through difficult times, as well as their physical needs. So last November, after Mayor Murray and County Executive Dow Constantine declared a State of Emergency on homelessness, we decided that we would adopt the issue of homelessness for the next few years as a major organizational focus. This is a big commitment for us — it’s not just another community program, it’s a full organization commitment to bring our resources to bear to try to make a real contribution to this problem. We’re calling the initiative Simple Gifts. Most people know the famous Shaker hymn, but for us the words have a broader meaning. They speak to the idea that music is a gift both to give and receive, and to our belief that everyone, regardless of background or social status, has the gift of music within them waiting to be released. The first is large-scale creative projects. We have three amazing in-depth partnerships planned for next season — creating new chamber music with Path with Art inspired by their year-long project “We Are All Here;” another is a continuation of the Lullaby Project with the moms and dads at Mary’s Place, and then we’ll launch a new project called Holiday Symphony, which will see participants creating artworks to be projected on a big screen in Benaroya Hall during orchestra performances next February conducted by Ludovic Morlot. Then there are Strategic Residencies, which are about being a regular and consistent presence in the community. This is about creating tailored musical residencies to support our partners’ goals, such as building self-advocacy, resiliency, creativity and teamwork skills. And in fact, just this week we’re launching a new program with Plymouth Housing Group, helping reconnect individuals with the broader community through composition. The third is about Raising Awareness. Through our many events, communications and publications we reach over a 100,000 people each year, and our goal is to use this platform to support our partners in raising awareness about their work, and to try and increase the general public’s understanding about who the homeless population really is, bringing life to the human stories about lost jobs, domestic abuse, catastrophic illness and displacement that give rise to homelessness. And finally, we’re interested in exploring the notion of Collective Community Service for our musicians, staff and board to volunteer together to support the needs of our community partners. Many of our partners are here today, so if you need volunteers or have ideas about projects that would be meaningful for us to engage in with your organization, we’d love to hear from you. I passionately believe the way of the future for arts organizations is for them to commit to their communities with the same passion that they commit to their art forms. Simple Gifts is our way of stepping forward and showing that commitment and our attempt to make some small impact on our community in the way that we know best: through the power of music. Read more about Simple Gifts and the Seattle Symphony’s multi-year initiative to spark joy, alleviate trauma and connect individuals with their creativity.